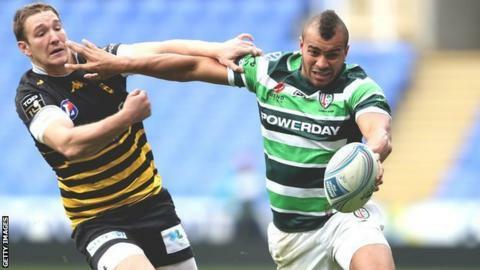 London Irish ran in 11 tries against Mont de Marsan to ensure they stay top of Pool One in the Challenge Cup. Exiles had a bonus point by the half-hour via tries from Jamie Gibson, Bryn Evans, Halani Aulika and Ian Humphreys. Thibault Duvallet kicked four penalties and converted Mathieu Giudicelli and Vickus Liebenberg tries for the French. But second-half scores from Jonathan Joseph, Sailosi Tagicakibau, Anthony Watson (2), Topsy Ojo (2) and Jack Winter-Moates saw Irish home in style. London Irish: Watson; Ojo, Joseph, Armitage, Tagicakibau; Humphreys, O'Leary; Lahiff, Paice, Aulika; Evans, Garvey; Danaher (capt), Gibson; Hala'ufia. Replacements: Lawson, Yanuyanutawa, Halavatau, Low, Treviranus, Gaston, Shingler, Moates. Mont de Marsan: Claverie; Beaulavon, Durquet, Baegert, Ryder; Duvallet, Pic; Fiorini, Bordes, Giudicelli, De Chaves, Lewaravu, Brethous, Farre, Lescure. Replacements: Paquet, Phelipponneau, Dos Santos, Liebenberg, Magnaval, Douvesy, Dubie, Correia.